I first saw the detachable collar in Refinery29. The Man Repeller blogger Leandra Medine road-tested a spiked version by Eleven Objects, showing different ways to wear it. It was cool, but the collar, at $325, was a steep offering. Definitely not for Kat Dy Finds! In another feature, Refinery selected six different pieces, but I found that the best ones were still pricey, ranging from $295 to $640. A few weeks ago, however, while browsing through Lucky’s July issue, I found a dainty, pearl-encrusted version by H&M. I liked it so much that I asked my crafty sister, Nina, to make me one. Using one of my old tops, Nina cut off the collar and beaded on a simple pattern using a combination of round and rice pearls. She edged it underneath with a ribbon of lace. Finally, she sewed on a rhinestone button to attach the ends together. Voila! A nifty, yet easy-to-make DIY piece that only requires rudimentary sewing skills. Up to making one for yourself? 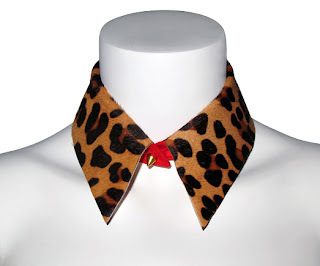 What’s great about the detachable collar is that there’s a multitude of designs and style you can execute. Instead of using pearls, you can also use metal studs, crystals or sequins. We used a pointy collar, but rounded, peter pan styles can also evoke that romantic mood. 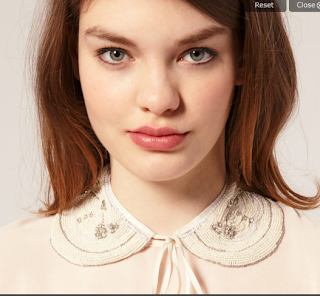 ASOS collar, a cheap find at $9.15, but unfortunately sold out! Eleven Objects leopard print collar made of pony hair, $295. Love the red collar stand peeking out. Wondering how to wear it? Heavily detailed collars stand out best when given a plain backdrop, while a bold-hued collar pairs excellently with printed pieces. 1) Wear it to spruce up a simple tank or tee. I wore mine with a gray tank and suede skirt, but it'll also go well with a pair of lace shorts that I have. Tank, Topshop. Suede skirt, bought at a Milan flea market. Shoes, Rachel Comey. Leather wraparound bracelet, H&M. Mesh bracelet, bought at a NY sidewalk store. Vintage shades, gift from my friend, Larissa. 2) Do like Hailee Steinfeld and accessorize a sheath dress with a fancy collar. Hailee shows off an elegant Miu Miu dress. Photo courtesy of Fabsugar. 3) Leandra Medine chose to add edge to her embroidered tank with a studded pony hair collar by Eleven Objects. How will you wear your collar? But nothing beats DIY'd collars of course! Hi Kat! Came here by way of Topaz Horizon. I actually bought a tangerine leather collar months ago but I haven't worked up the guts to wear it. Your styling tips are great... maybe I'll finally break out the collar soon! Hi Kat, I'm selling detachable collars! Please visit missartorial.multiply.com for available designs and colors. Thanks! Hi Sharon, I'll check this out! :) Exciting!